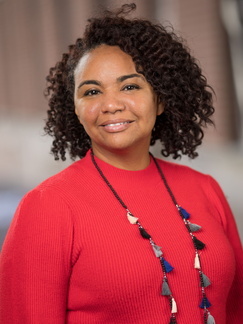 My research primarily focuses on environmental (social and physical) and psychosocial factors that contribute to women’s health across the life course, with emphasis on the maternal and child health (MCH) of marginalized/underserved populations. In particular, I seek to improve our understanding of the social meaning of race and skin color and how they intersect with other aspects of social identity to affect health. My goal is to utilize the knowledge gained from my research to apprise the development of novel and interdisciplinary community-based solutions focused on building healthier and more equitable communities that help us to achieve MCH equity for all. Health equity, maternal and child health/perinatal epidemiology, social determinants of health, racism, colorism, life-course perspective, perinatal health, women’s health, prenatal care, prenatal home visiting. For a complete list of publications, see my PubMed page. Slaughter-Acey, JC, Talley, L, Stevenson, H, and Misra, DP. “Personal versus group experiences of racism and risk of delivering and small-for-gestational age infant in African American women: a lifecourse perspective,” Journal of Urban Health, July 2018. Sheller, S, Hudson, K, Bloch, JR, Biddle, B, Krauthamer-Ewing, ES, and Slaughter-Acey, JC. “Family care curriculum: a parenting support program for families experiencing homelessness,” Maternal and Child Health Journal, June 2018. Korzeniewski, SJ, Slaughter, J, Lenski, M, Haak, P, and Paneth, N. “The complex etiology of cerebral palsy,” Nature Reviews Neurology, Sept 2018. Slaughter-Acey, JC, Sealy-Jefferson, S, Helmcamp, L, Caldwell, C, Osypuk, T, Platt, RW, Straughen, JK, Daily, R, Abeysekara, P, and Misra, D. “Racism in the form of micro aggressions and the risk of preterm birth,” Annals of Epidemiology, Jan 2016. Slaughter, JC, Issel, LM, Handler, A, Rosenberg, D, Kane, D, and Stayner, L. “Measuring dosage, a key factor when assessing the relationship between prenatal case management and birth outcomes,” Maternal and Child Health Journal, Oct 2013. 17(8):1414-1423.